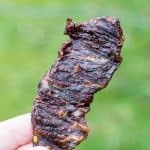 Traeger jalapeno poppers are a classic bbq appetizer. 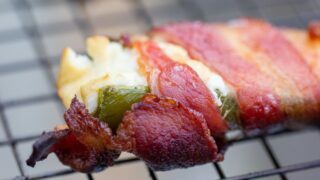 Jalapenos that are stuffed with cream cheese and wrapped in bacon and cooked on your wood-pellet grill. 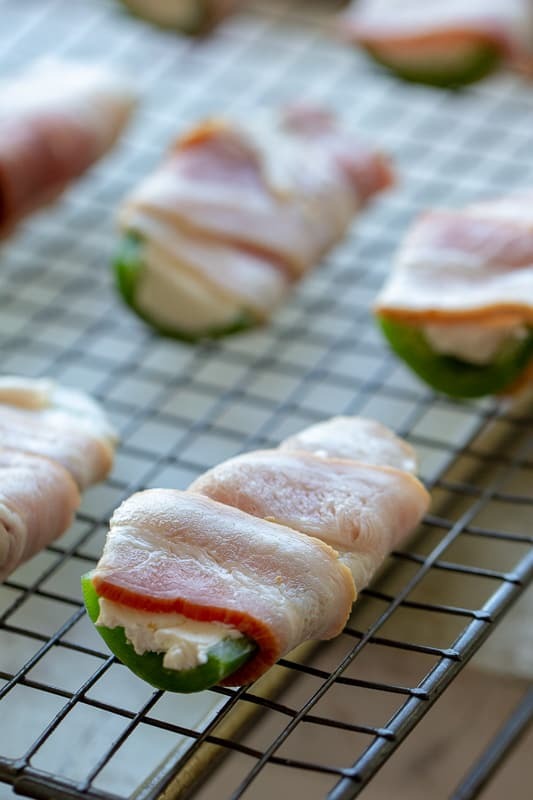 Grilled bacon-wrapped jalapeno poppers are the perfect snack to serve up as an appetizer to feed a crowd. Jalapeno poppers are creamy, savory, and downright habit-forming. 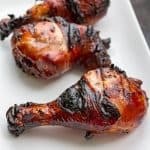 Whether you bite into these fresh off the grill or eat chilled the next day, they are outstanding in flavor. 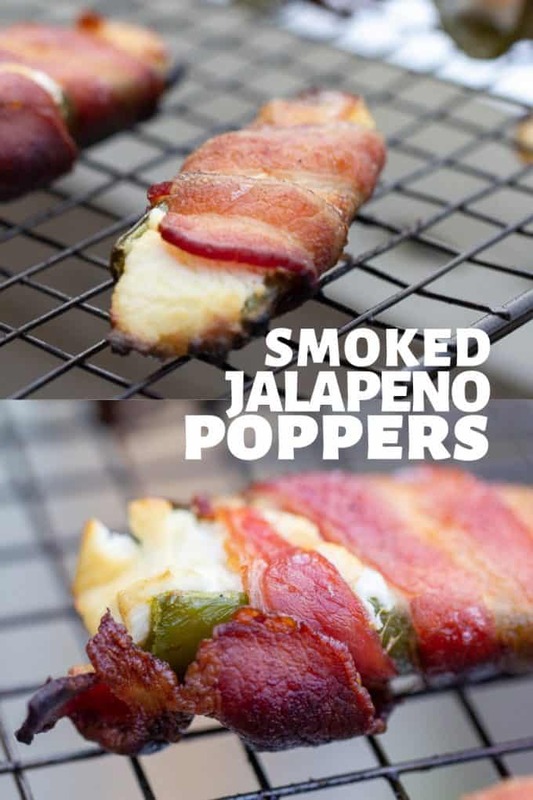 The combination of jalapeno, cream cheese, and bacon is one lethal combination. 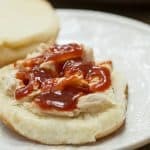 It works so well together, and the Traeger offers a nice light smoke flavor to add a whole new dimension to the mix. I will be honest, I have tried making these in the oven, and it just isn’t the same. 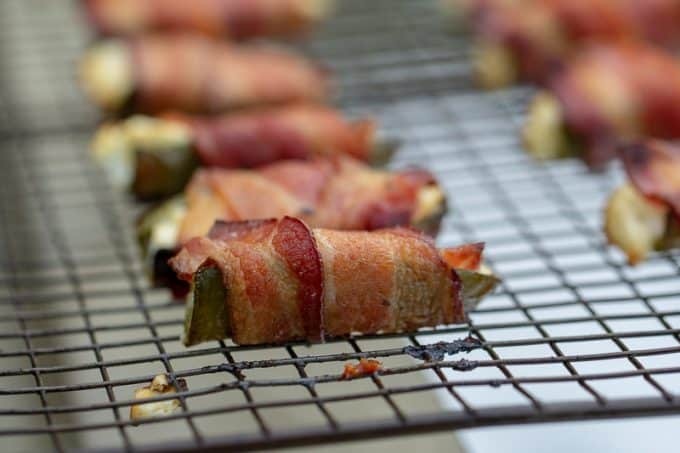 I will always favor grilling jalapeno poppers over any other method of cooking. Removing the seeds and membrane helps to reduce the heat in the jalapenos. I highly suggest wearing gloves when working with jalapenos and be in a well-ventilated area. The oil from the jalapenos is strong. Take a toothpick and stick through the bacon. If you are working with larger jalapenos then use multiple toothpicks. As the bacon cooks it will shrink, and if you don’t secure the toothpicks it will fall right off the peppers. The process of making these is a little bit of work, but the end result is totally worth it. You start by slicing your peppers in half, lengthwise. Once you get your peppers sliced, de-seed and remove as much of the white membrane as you can. This is what is going to help make the heat calm down. If you want to keep some heat, leave some seeds. Rinse your peppers well in running cold water and set aside. Use room temperature cream cheese and scoop the cream cheese into the peppers, and then set aside. 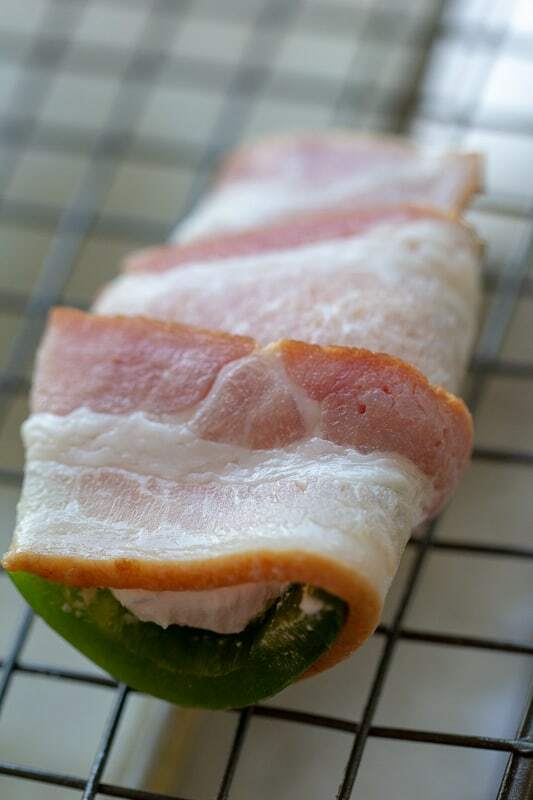 Grab your bacon and slice it in half, and wrap around the peppers and secure with a toothpick. 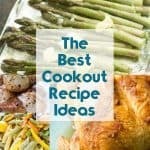 Toss on the grill and cook until fully cooked. 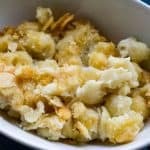 The full directions for this recipe are below. If you grow your own jalapenos this is a wonderful way to use up your peppers this summer. This duo is shockingly good! 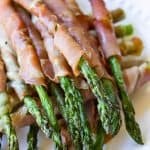 The prosciutto will cook a lot faster on the grill, so it will leave your peppers a little bit crunchier than bacon, but the flavor and texture work well together. How do you know if jalapenos are ripe? Here are some key things to look for when picking peppers off your vine or choosing them in the store. Size | Look to see that the pepper is around four to six inches in length. Shape | You want your jalapenos to be fat, firm and offer a shiny or waxy sheen. Color | Bright green peppers are what you want to look for. As they age they will become darker green, then black and red. If you see the peppers have indentions or seem to be mushy in spots, don’t get them. They are starting to go bad, and if you toss one bad one in with fresh ones, it will begin to break down the rest of your peppers. Pair your jalapenos with your favorite grilling foods or baked chicken or pork in the oven. 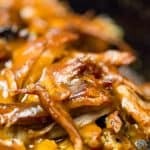 This Traeger jalapeno popper recipe is versatile and pairs nicely with so many main dishes. 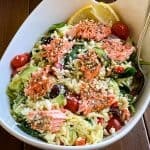 We make these all summer long, and it never gets old! 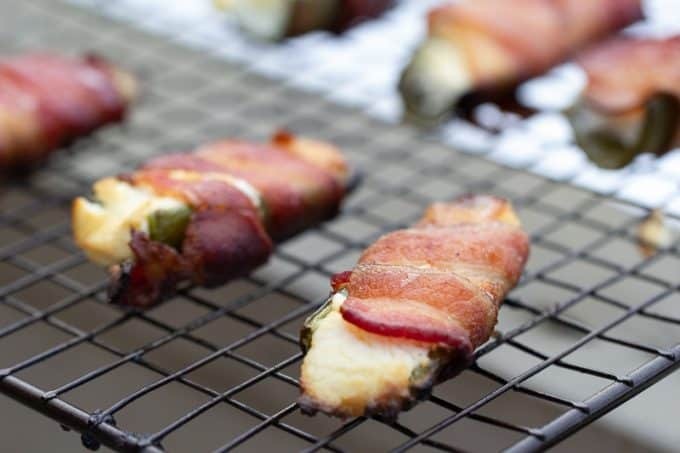 These classic jalapeno poppers are smoked on a Traeger wood-pellet grill, and wrapped in bacon to make the traditional popper pop a little more. 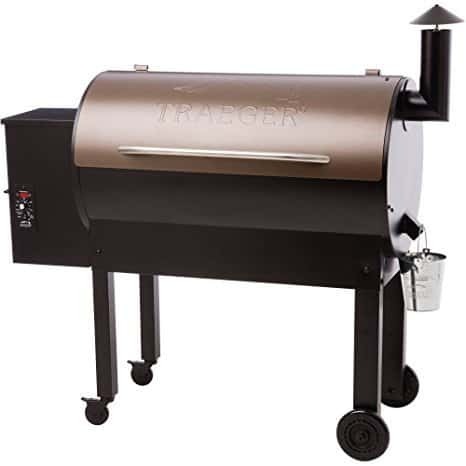 Preheat your Traeger or other wood-pellet grill to 350°. Wash and cut the tops off of the peppers, and then slice them in half the long way. Scrape the seeds and the membranes out, and set aside. 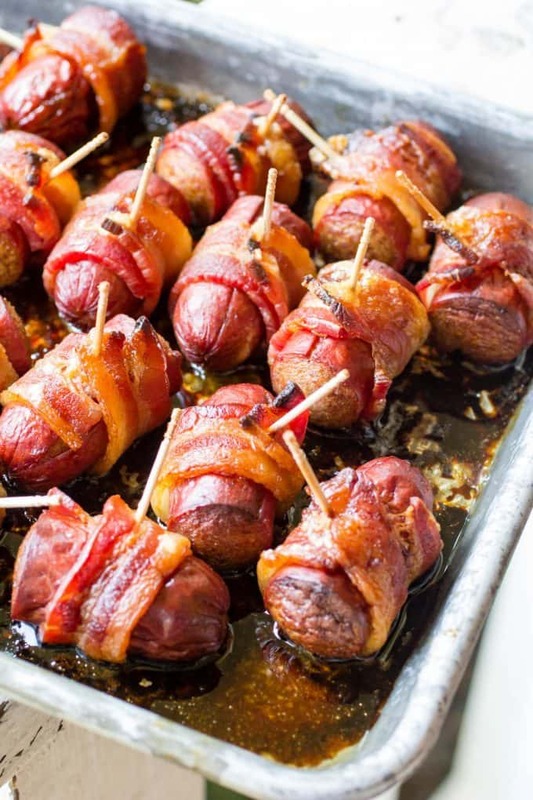 Spoon softened cream cheese into the popper, and wrap with bacon and secure with a toothpick. Place on wire racks that are non-stick or have been sprayed with non-stick spray, and grill for 20-25 minutes, or until the bacon is cooked.